As Graduation Approaches. . . I am starting to see myself in the light of my future and I am eagerly anticipating what it holds for me. It seems these past few years in Texas has been fraught with many tests and trials. Through it all, I believe I am on purpose, in the will of God. As I evolve, I am maturing in insight. I no longer see men as trees but as merely men. I have learned that I can cast my own life. Friends of the past are not necessarily going to be friends of the future. I deserve reciprocity of love, respect, and support. If we are not on the same page, the story will continue without you. This is hard lesson for me. I have a habit of holding on to things and people for the sake of having something or someone to hold. I am so over it. God is showing me how to open myself up to new relationships, friends, experiences that I would have been to timid to embark upon. At this stage of my life, I am truly ready. 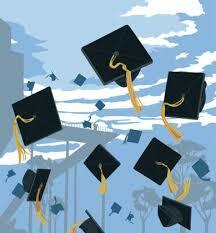 Oh yeah, I graduate next Friday!!!!!!!!!!!!!!!!!!! !This is a hallelujah moment!!!!!!!!!!!!!!!!!!!!!!!!!!!!!!! This is so true. I’m not graduating until next year, but i have a lot of friends that are, and let’s just say, i won’t be missing everyone that leaves. I just feel like God has shown me who my real friends are over the course of this school year, and now that it’s coming to a close, i wish i would have done things a bit differently. I now realize that i only have a few friends that were true and genuine, but what’s unfortunate is that i wasted a lot of time with “friends” that i now see are only about themselves. I spent a lot of time trying to build memories with the wrong people.
" I spent a lot of time trying to build memories with the wrong people." If you have learned this lesson, then you have not wasted your time. Every experience teaches us something. The bible states that there is friend that sticketh closer than a brother. Sometimes people are meant to be in your life for a season, When that time passes, you both have to move on.